Mega Sale! 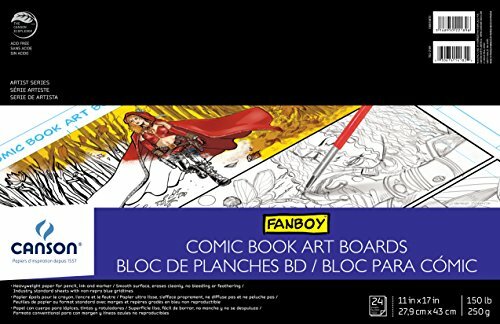 Save 30% on the Canson Comic Book Art Boards Pad with Preprinted, Non-Reproducible, Blue Lines, 150 Pound, 11 x 17 Inch, 24 Sheets by Canson at Designers Artists. MPN: 100510872. Hurry! Limited time offer. Offer valid only while supplies last. Size: 11 x 17 Inch Paper. Canson's Comic and Manga Artist Series Pads have a heavyweight paper with excellent resistance to erasing and scraping. Size: 11 x 17 Inch Paper. Canson's Comic and Manga Artist Series Pads have a heavyweight paper with excellent resistance to erasing and scraping. Great for use with marker, pen & ink, and pencil. This paper features a smooth texture with preprinted, non-reproducible, blue lines. Suitable for use with a lightbox. Contains 24 sheets of 11 x 17 inch, acid free, 150 pound/250 gram paper. If you have any questions about this product by Canson, contact us by completing and submitting the form below. If you are looking for a specif part number, please include it with your message.